Tir Éoghain 2009 – Bígí Linn! 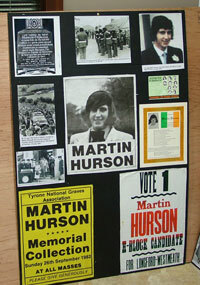 THE National Hunger Strike Youth Weekend 2009 is taking place in Tyrone over the weeknd of 14 -16 August. The weekend of events is being organised to coincide with the National Hunger Strike March, and will also fall on the actual 100th anniversary of Fianna Éireann, Sunday 16 August. The main themes of the weekend will be the ‘The 1981 Hunger Strike’, and ‘A Century of Youth in Struggle’, with public talks, a republican tour, a Fianna Éireann dinner dance, mural and plaque unveiling, a rebel night, and the National Hunger Strike March helping bring people together and educate them on both. The weekend is expected to be Ógra Shinn Féin’s biggest event of the year with the republican youth movement and international guests turning out in numbers to commemorate the 100th anniversary of Fianna Éireann on Sunday 16 August. They will unveil a plaque to the first national republican youth organisation and then form up in a large Fianna contingent in the Hunger Strike March. “The weekend will be an excellent opportunity for young republicans and our international comrades to come together in remembering the Fianna and the Hunger Strikers. “The many events throughout the weekend will be spread across Tyrone and will be open to the public to ensure the maximum number of people learn more about these significant themes. The weekend will cost £40/€45, which covers the Fianna Dinner Dance, all meals, accommodation, republican tour, and entrance to the rebel night. The weekend fee will need to be paid no later than Friday 31 July. If you are interested in attending or would like more information please contact [email protected], or 0788 556 9940.